“…I became a Christian at 14 when I attended a play called “Heaven’s Gates, Hell’s Flames.” It was super eye-opening because it was really the first time I was faced with the reality that one day my life would be over and I would pass away from this earth. I knew I wanted to go to Heaven, so I knew I needed to make the decision to follow Christ. For a long time, I had assumed I was a Christian because I was a good person and went to church. But I realized that was a mistake because I never truly gave my life to Christ. That night, the Gospel was preached in such a way that was offensive and made me uncomfortable. But it was only offensive and uncomfortable because it made me look at my sin. It was a true conviction. I couldn’t leave that night without making that decision…” Young singer/songwriter Nathan Sheridan has had quite a ride, in becoming a music artist. He’s had to live with abusive parents before his grandparents took him in, he’s had to endure his sister dying because of cancer, and he’s had to see first hand soldiers dying in Kuwait as he was part of the Army National Guard for a while overseas. Sure, all of these events could have shaped him rather negatively, however what has now resulted is Broken With You, Nathan’s full length debut album- and also being the first artist on Burtonwood Records- founded by Seventh Day Slumber’s Joseph Rojas. And from listening to this 11-track album, I can tell you that Nathan has put his heart and soul into this project. There’s no denying the passion, and even after all of the things in his life right now, Nathan still praises God; that, you guys, is very remarkable indeed. Opening the album with the big booming “Starts With You And Me”, a country/jazz/pop/gospel melody that beautifully employs Nathan’s powerful voice, we are inspired and challenged to act out our faith- wanting to see change is one thing, but actually making a difference by moving first is something we should all aspire to undertake. This theme of being a Christian and showing it to the world, is actually present throughout the whole album, as Nathan continues to encourage and provide us with hope and reassurance of our security in Jesus Christ; and it’s great that such an overarching theme reminds us all to be better as humans and rise above any adversity with Jesus in our lives. “Nothing But You” follows in the same theme, as Nathan expresses his utter devotion to God, declaring that we need nothing except for Him; though sometimes singing God’s praises in public in this day and age can be a bit out there, Nathan reminds us all that Jesus has done great things, so why should we keep our faith quiet? “Don’t Get It” is next, and is a light electric guitar led pop ballad, where Nathan encourages us to keep fighting the good fight, and to block out the haters, because some people ‘don’t get it’; yet for me one of the most inspiring and poignant melodies you could ever listen to on this album (and this year actually!) is “Who You’ll Always Be”, a hymn like radio friendly slow tempo ballad, that ardently relays to us that ‘…only Your love is higher than the heavens, and only Your love is deeper than the sea, and only Your love goes on and on, and on and on forever, and just who You are is who You’ll always be…’. With Nathan being at the top of his game here vocally, he carries the gumption and gusto into “Minute By Minute”, a hopeful guitar led country/bluegrass/folk/rock melody that channels his inner David Dunn and Stars Go Dim as he relays to us to take life minute by minute so that we don’t take on too much and end up being burnt out; and also vulnerable heart and soul in the acoustic guitar only ballad “Broken With You”, where Nathan voices out all of his anger and hurt, all of his questions at God for all of the bad things in his life, and then concludes that he has to believe that Jesus has a plan because of the promises in the Bible, and that at least Nathan is broken with Jesus by his side. Going back to the worship genre, Nathan delivers an honest, emotional and inspiring melody in “His Name Is Jesus”, which essentially proclaims that our Saviour’s name is Jesus, the One whom we can call upon at any and all times (and that declaration alone should never get old, and should in theory send goose-bumps up our spine in awe and reverence! ), while the autographical “Again” ends an already strong album, and pays tribute and homage to the inspirational people in Nathan’s life, making him who he is as a Christian and as a person today. “…I believe this was all a Divinely orchestrated process-God had these things planned out for me from the beginning. Music was never something I grew up with and it was never something I thought I would do. But here I am doing it and I really can’t say that it’s been by my own power. The opportunities I’ve been given are things some artists work tirelessly for years to get. There have been some really tough times when I wasn’t sure if I could do this, but God has shown me time and time again how faithful He is. He has always opened doors and made a way for me in the music industry. He’s given me a platform to share my testimony night after night. 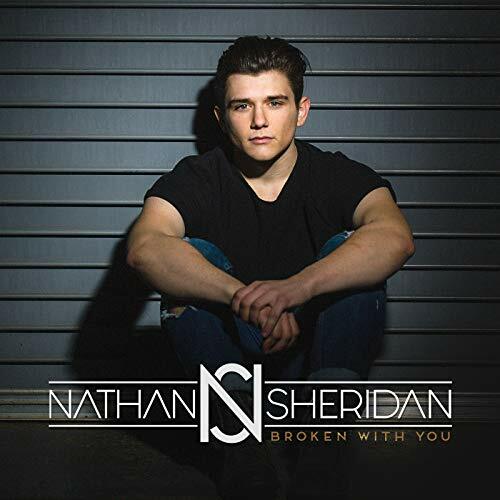 He’s done this for me so that I can share the Gospel with others and be a light during some really dark times…” As a debut album, Nathan Sheridan’s Broken With You is as solid as they come. Though there are a few ho-hum melodies (like the album closer and “Alone In The Garden”), the good definitely outweighs the bad here, as we are inspired to have a faith like Nathan’s and live more actively for Jesus. A standout amongst all 2018 albums; I will definitely listen to this album on iTunes and on Spotify in the coming weeks and months. Well done Nathan for this tremendous effort, I can’t wait to hear what God has in store for you next!